The apartment is situated in the town of Arzachena, it has two bedrooms, one bathroom, kitchen, living room with balcony overlooking the countryside, it is air conditioned, you would find supermarkets bars , bank just few minutes walking distance. The apartment is just few minutes away by car from the beautiful Costa Smeralda with its gorgeous beaches and its glamorous restaurants and shops. Places to see near by are Baia Sardinia, Porto Cervo, Cannigione, Porto Rotondo a trip to la Maddalena and its islands is highly recommended. We returned to this apartment having had such a fantastic time before. If you are looking for a relaxing holiday in a town that provides a cultural insight into Sardinian life then this is the place for you. Having a car to get around is essential if you want to explore the amazing beaches and beautiful views around the island. 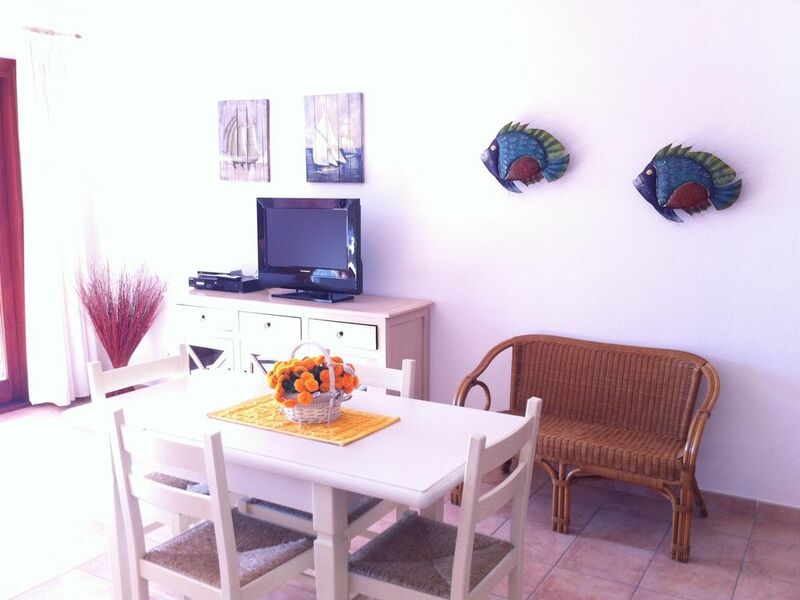 The apartment is conveniently located and easy to find from Olbia airport. It is spacious and clean, with all the amenities you need for a relaxing holiday. Lots of shops and restaurants are in the immediate area and pizzeria in the town square called Bru&Gio is a must! We have just returned from a fantastic week in Sardinia. This apartment was perfect for our needs - it was spacious, well equipped and local to all coast of Costa Semeralda where you will the most amazing beaches. The shops are very local, there are some decent restaurants and there is a really nice main square with a great place to drink and watch the sun go down. My husband, two year-old daughter and I had a great week in this modern apartment. It is very conveniently located as a base to explore the North-East of Sardinia. It was newly furnished, spotlessly clean and the parking underground was a blessing (the car was always cool when we got in). The owner and his family were all lovely people to correspond with and we would certainly come again! We stayed in this flat in July 2008 and we absolutely loved it. The flat is brand new, spacious, clean and nicely decorated. We didnt have any problems finding the flat since the owner had given us good directions and he was there to greet us when we arrived. There are some shops and a cafe in the building and I think we counted three supermarkets withing a couple of minutes of walking! We also went into Arzachena town centre where we ate the best "pizza al taglio" at the Focacceria Genovese. As with everywhere in Sardinia you need a car and the apartment block has a designated parking space in the garage which was very convenient. The closest beach is 10 minutes away by car but we would suggest you to rent a boat or go on one of the many organised tour of the Islands in front of the Costa Smeralda. It's amazing. We also went to S. Teresa di Gallura and Alghero for excursions. Very spacious, clean and bright. Balcony is excellent - very relaxing. If you like eating, plenty of excellent and good value restaurants closeby. Tenuta Pilastru is a must - an "agriturismo" serving local traditional food from a glorious location at a very good price! Great range of immacualate beaches. Recommend hiring a boat to the islands! Market in town on Wednesdays worth a visit. We also went to Corsica for the day (Santa Teresa to Bonifacio) - fantastic! We also enjoyed visiting Porto Cervo and Porto Rafael. Highly recommend appartment and area. Very good value for money. Die Ferienwohnung liegt sehr günstig um die Nordostküste Sardiniens kennen zu lernen. In der Wohnung ist es sehr sauber und mit allem ausgestattet was man für einen Urlaubsaufenthalt benötigt. Wir haben fast jeden Tag genutzt um einen neuen Bereich der Küste mit den malerischen Stränden zu entdecken. Die Buchung und die Schlüsselübergabe haben sehr gut funktioniert. Der Vermieter ist sehr freundlich und hat uns jederzeit mit Informationen unterstützt. Einen Stern muss ich leider abziehen da wir kein W-LAN hatten und wir unsere Informationen zur Tagesplanungen gerne über das Internet holen. Auf jeden Fall ist diese Wohnung eine Empfehlung! Prices on low season , and minimum staying can be negotiable. the prices showing include everything, bed linen and towels also provited and included in price. Price may change according to the number of people . 10% discount apply for a staying of two weeks , this offer does not apply the month of August .